Your cultural itinerary includes sights like Sea Fortress Suomenlinna and Ullanlinna. Visit Aurinkolahti Beach and Hietaranta Beach for some beach relaxation. 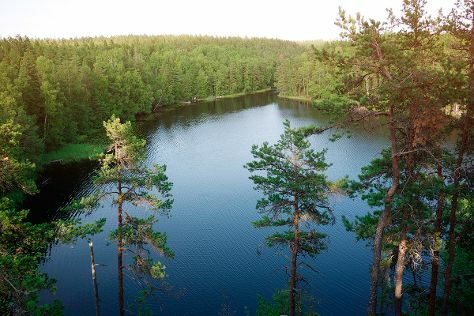 Explore the numerous day-trip ideas around Helsinki: Sipoonkorven Kansallispuisto (in Vantaa) and Espoo (Nuuksio National Park & Arctic Expedition). There's lots more to do: wander the streets of Katajanokka, relax and rejuvenate at some of the top local wellness centers, tee off at Tapiola Golf, and indulge your thirst for a good beer at Stadin Panimo. Plan my Helsinki trip by asking Inpirock to come up with tips and suggestions. New Delhi, India to Helsinki is an approximately 9.5-hour flight. The time zone difference moving from India Standard Time (IST) to Eastern European Time (EET) is minus 3 hours. Prepare for much colder weather when traveling from New Delhi in May: high temperatures in Helsinki hover around 18°C and lows are around 7°C. You will have some time to spend on the 11th (Sat) before leaving for home.